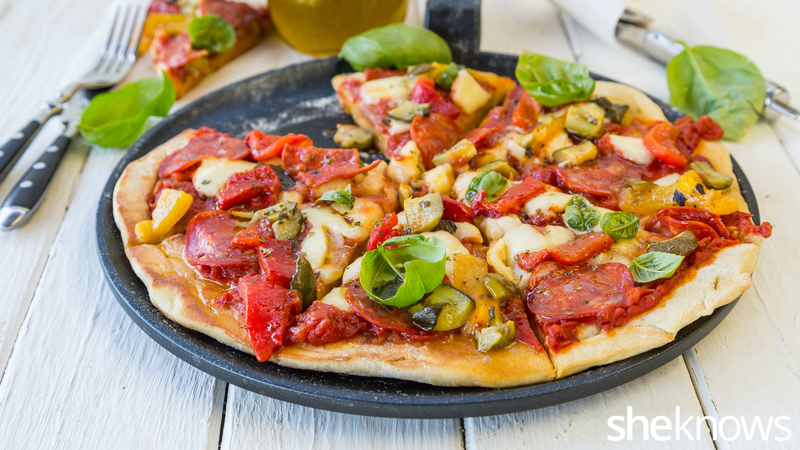 Instead of baking it in the oven, cook your pizza in a skillet on the stovetop. 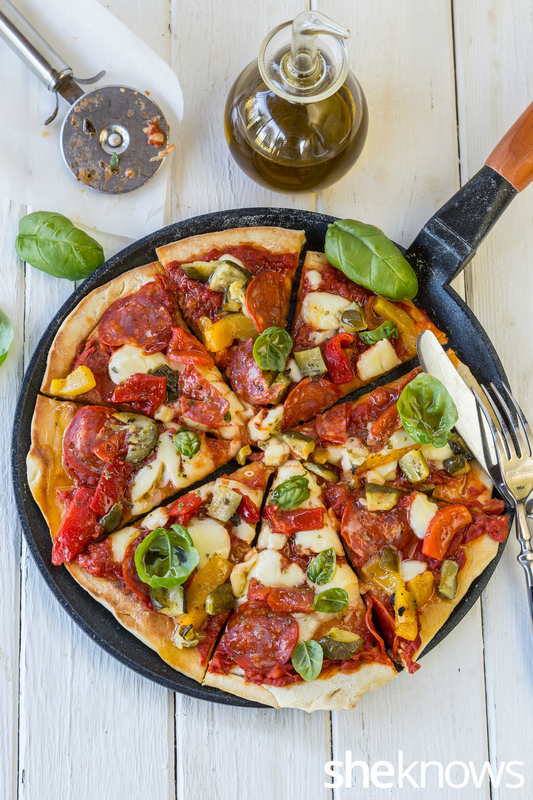 You don’t need hours or even an oven with this quick and easy skillet pizza recipe, because 1) you can use premade ingredients you can round up at the supermarket, and 2) you cook the pizza right on the stovetop. In under 30 minutes, this pizza will be cooked and ready on your table. In Italy, I can easily go out, because pizza places are everywhere. I mean really everywhere. But there are times when I just want to prepare my own at home the quick way. That means using ingredients that are already in my kitchen, like bottles of roasted vegetables, marinara sauce and slices of salami. Making a good pizza dough takes hours of waiting for the rising, so with that in mind, I sometimes take a shortcut by buying the premade pizza dough at the supermarket. The pizza that comes out of the skillet will make you forget about eating out. Just remember to eat it as soon as it is cooked, because that is the peak of the pizza’s deliciousness. When you don’t have the time to make pizza from scratch and an oven to bake it in, don’t worry. Gather all the premade ingredients in the supermarket, and in under 30 minutes, you can enjoy your own version of home-cooked pizza right in your own kitchen. Customize the toppings to your favorite meats and veggies. Sprinkle some flour on your work table, and spread out the pizza dough. Using your hands, adjust the size of the pizza to correspond with the skillet you are using. Into a skillet brushed with olive oil on low heat, place the pizza dough, and cook for 6 to 7 minutes or until the dough has colored. Turn the pizza dough over carefully to cook the other side. After the pizza dough has been turned, you have to work fast. Spread the marinara sauce on top of the pizza, then distribute the salami, peppers, zucchini, mozzarella, oregano and basil. Cover to make the heat inside the skillet melt the mozzarella. Cook for 6 to 7 minutes or until the bottom has colored. In case the mozzarella doesn’t melt enough and the pizza is already cooked, pop it under a grill for a few seconds just to melt the cheese. When cooked, drizzle with olive oil, and then serve immediately.